True augmented reality is still a ways away, but that hasn't stopped companies from getting started. Apple and Google have their ARKit and ARCore initiatives to help build an ecosystem of AR apps before they put hardware on our face. There's also the likes of Microsoft, who has the more enterprise-focused HoloLens working around in the background. And then, if you're more into fun and games, Merge has its AR Cube ready for you with a handful of experiences. So we've decided to collect some of favorite apps and games thus far. There are more coming out every day, and they're getting better as these companies upgrade their abilities and platforms. So you can bet we'll keep updating this as the ecosystems start fleshing themselves out. Have you ever wished you could simply draw on reality? Camera apps like Snapchat and Instagram make that semi-possible, but it feels much more real with LightSpace. You can paint with your phone as you move around, and then when you're done you can move through your art. You can even take videos and photos to share. Boulevard has already used VR to find a way to immerse ourselves in our appreciation for art, and now it's using augmented reality to bring that appreciation to us. The app will let you place 8K versions of the Tudor collection directly on your own walls. Why go to the museum when you can bring the museum to you? You haven't felt pain until you've accidentally stepped on a LEGO brick. Thanks to LEGO AR Studio, you might never feel that pain again. You'll get to mix and match digital versions of your favorite LEGO sets - no need to worry about a thousand bricks laying around your living room floor. Your feet will thank you. 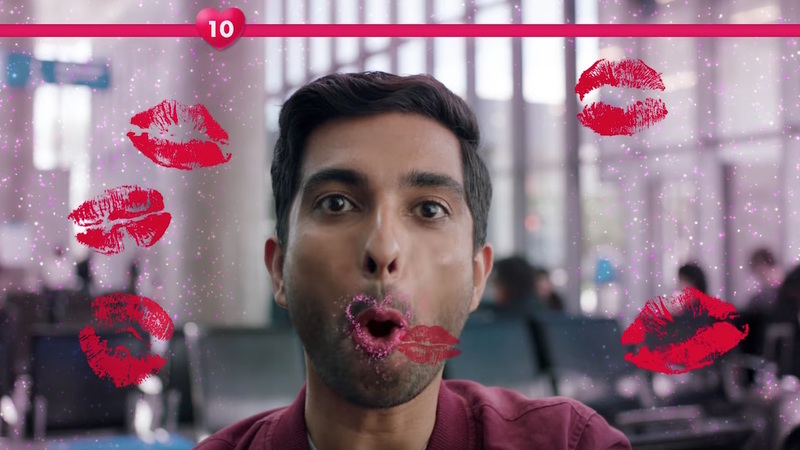 You could make the argument that Snapchat is partially responsible for turning augmented reality into something people use daily. Its facial filters have become wildly popular, so much so that everyone else has copied them. Snapchat has also gotten upgrades that let you place things in the virtual world, and they've even started adding games to the proceedings. It's almost like they're building an ecosystem of AR experiences for smartglasses. Rocket launches are extraordinary events, but what if you could take a look at a rocket launch in your living room in augmented reality? Even better, what if it was live? That's exactly what USA Today's 321 Launch app is all about. It provides a live, AR version of actual rocket launches. If you just want to blow things up, the Transformers franchise is naturally a good place to start. This AR experience lets you place the Autobots base and then use everyone's favorite Camaro, Bumblebee, to, well, destroy everything. It's simple, absurd and fun. Michael Bay in video game form. Your childhood dreams are about to come true. Instead of pretending to battle big robots in your living room or backyard, Army of Robots lets you do it (almost) for real. Use your phone to scan for robots, and be prepared to move around to avoid all of those incoming missiles and lasers. Stack is a simple game. You just tap blocks at the perfect time to stack them. Things get real in AR, as it feels like there are actual stakes to your stacking - it feels like things could collapse at any moment and threaten you with picking up the pieces. The subtle power of AR. The BBC is bringing you over 30 historical artifacts to examine in your own home. You'll be able to get up close and personal with a mummy, to sculptures and more. As you see them in their full glory, you'll also be able to take a look at background information on them. PuzzlAR takes jigaw puzzles to the next level. Pieces of the Statue of Liberty, Taj Mahal and Forbidden City will float right in front of you. You'll be able to grab them via AR (and your smartphone) and piece them together to complete the puzzle. The phenomenon that was hasn't gone away. In fact, it's only gotten better. There's a new raids feature that lets you team up to take down bosses. The gyms are still around, but now you can research your world and complete objectives to unlock rewards and Pokemon. You'll seriously never stop catching them all. Magicplan uses the power of augmented reality to help make creating floorplans of your home easy. You just pick out what room you're in, head to the corners, press a button and magically watch the app put together your floor plan. If you need more than just furniture, and don't want to be saddled to a single brand like IKEA, Houzz's app is a good option for you. There are over a million pieces of furniture, decor and remodeling products available for you to test (virtually) in your home. IKEA's AR app is surprisingly entertaining and simple, letting you choose from the tens of thousands of IKEA products and place them in your home. There's also now visual search, so you can point the camera at a piece of furniture in your home and see if IKEA makes something similar. Skype used to be the big dawg in the world of online communication before Slack, FaceTime and WhatsApp came along. In the world of augmented reality, however, things are still possible. You can install Skype on Windows 10 and experience your video calls in wonderful AR. If you're new to HoloLens then this is a good way to get introduced. Even better, this is a part of Microsft's Mixed Reality Academy, and you'll be able to truly understand what the company means by Mixed Reality. You, in your HoloLens headset, will be able to help someone in a Windows Mixed Reality headset. Together, you'll have different perspectives of the island as you explore around. A good place to learn how to draw something is to first learn how to sketch something. It turns out augmented reality is the perfect way to learn to sketch. You can have a holographic version of what you want to sketch over your paper and can trace it that way. Just want to unwind a little bit? HoloLens Penalty Shooter is a good way to do that, putting a virtual pitch where ever you want. All you have to do is use your head to aim and your gesture to shoot. Score as many goals as possible before the time limit is up. Want to play a little game of truth or dare, with a helping side of attitude? Ask Kranky is a good option. You can ask it whatever you want and get a response, and it'll also give you dares and tell you about your future. Go ahead, he won't bite. Merge put together an augmented reality cube. If you're going to play games with it, the natural inclination is going to be an AR version of the beloved classic. You'll be able to move the cube around in your hands in your (probably) many attempts at matching those sides. In this experience, the Cube transforms into your portal to a story about two cousins who are shipwrecked on a remote island in Alaska. It's up to you to help make decisions and get them back home. Got a game night planned? You can bring along the Merge Cube and pop on Party Games, which gives you several party games like Crystal Crush and Top-N-Toss to compete against your friends. You can either play them with one Cube or multiple Cubes. If you're hankering for some Minecraft-like world building, Dig! is worth a look. You have unlimited resources in things like stone and wood to build whatever you want, from something as small as a tiny home to something as grand as a castle.